Here's yet another reason to love the former Lady Eagle. (SPOT.ph) There's no question in everyone's minds that Alyssa Valdez is carrying women’s volleyball to historical heights right now. But what makes her the real MVP is how eager she is to share her talent with her followers. The former Ateneo Lady Eagle just gave the term #SquadGoals a whole new spin with the Alyssa Valdez Skills Camp, an event for young athletes who are equally dedicated to improve their skills on the court. After four cities and two weeks of intense training and exhibition games, the camp drew to a close through an all-star game at De La Salle, Dasmariñas. The culminating event brought together the season’s top campers to play alongside the Volley Friends and mentors such as John Vic De Guzman, Mylene Paat, Shaya Adorador, EJ Laure, May Luna, and Valdez herself in an ultra-fun all-star game. 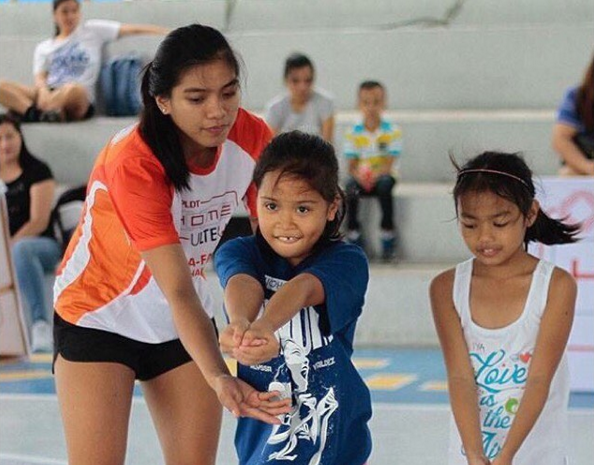 The Alyssa Valdez Skills Camp ran from May 5 to 22 in Laguna, Cubao, Batangas, and Cainta and was supported by PLDT HOME Ultera as part of its ongoing mission to promote volleyball to young athletes at the grassroots level. Now that the camp is over, she will be joining PLDT HOME Ultera Install Patrol, a nationwide tour which brings ultra-fast LTE connection to more homes with its new Plan 699, the most affordable home broadband plan. Here's to seeing more of Alyssa soon! This article was created by Summit Storylabs in partnership with PLDT.